I am a Brandon Sutter fan. I’ll always love Crosby and Malkin but give me a good bottom six guy any day. I guess I’m just partial to the gritty blue collar player who adds character as well as skill. Give me a role player like Sutter or Max Talbot or Mike Rupp any day! Role players are as essential to a team’s success as goal scorers are. They won’t appear as such on the stats sheet. If you go by stats alone, you’ll swear most of the role players are dead weight and therefore expendable. Consider that they are the guys who go up against the other team’s top line. They can play a shutdown game and throw the other team’s superstars off their game. Try having a team of all goal scorers and see how far you get. Many fans try to compare Sutter to Jordan Staal who previously centered the Pens 3rd line. Did Staal center the 3rd line because he IS a third line center or did he center the third line because he was third in line behind Crosby and Malkin? He certainly wasn’t put on the third line when he landed in Carolina. Brandon Sutter IS a third line center. Pittsburgh fans tend to evaluate Sutter with a critical eye. Every game it seems someone calls for him to be traded. What am I missing? Is he that bad? He seems like a fair guy to measure Sutter against. Both have comparable salaries; Sutter comes in at $3,300,000 while Neilsen's salary is $3,000,000. Sutter has 2" inches on Nielsen at 6'3" but Neilsen is the older of the two by 5 yrs at age 30. I took a look at scoring first. No one expects the 3C to be the team’s scoring leader but he is expected to contribute. I looked at the two centers, head to head, short-handed, even strength and in power play situations. I included average TOI in each setting to show opportunity to succeed in each circumstance. It should be noted that Sutter played 2 more games than Nielsen this season. The most surprising thing about the table above is 5v5 scoring. Sutter scored more goals but interestingly, both players ended the season with equal 5v5 points. What about face-offs? That's a fair comparison for two 3rd line centers. They were pretty even. I’m not trying to sell you that Brandon Sutter is better than a third line center just that he is a good 3C and already not dissimilar from perennial favorite Frans Nielsen. In injury situations, he’s able to fill in at 2nd or 1st line but he would be playing above his pay grade in the long run. Sutter is solid. He plays with drive, ambition and heart. 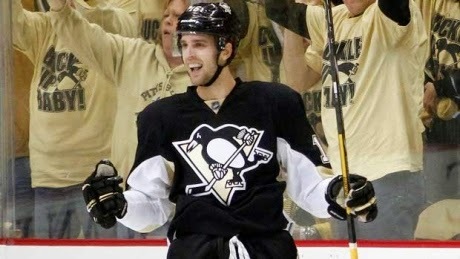 If you scanned the Pens bench looking for a hero Saturday in Buffalo, you likely looked right past Brandon Sutter. But then again if you were looking for a hero on the Pens’ bench in game 7 of the cup finals in 2009, you would have likely looked past Max Talbot.